In June, the United States Army Corps of Engineers (USACE) received $1M in work plan funding to complete the design of the Rio de Flag Flood Control Project. It is anticipated that Tetra Tech, a California based private design firm retained by the USACE, will take the existing 90% plans and complete the design to the 100% level. 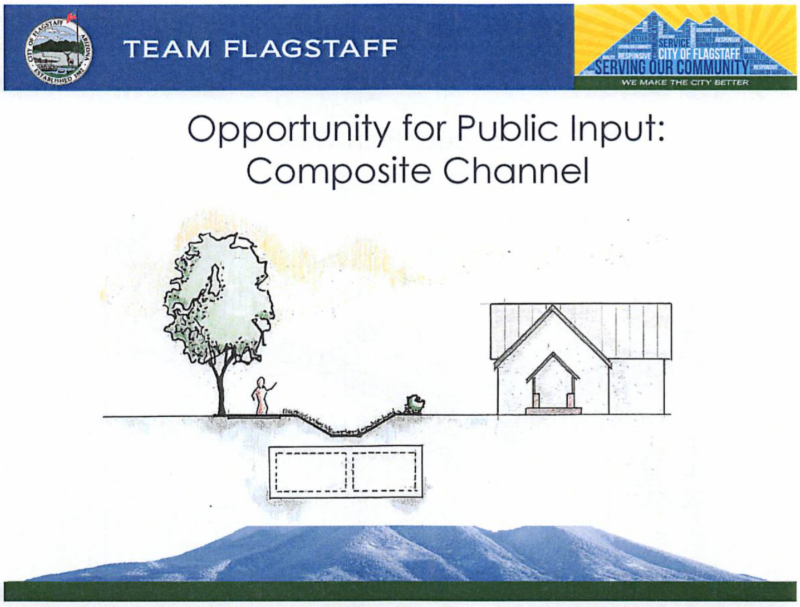 In order to facilitate this project design completion, the City of Flagstaff Community Development section invites the public to attend a Listening Session on Tuesday, August, 22nd from 4-7pm. This Listening Session will allow City staff to update Flagstaff residents on the current state and future timeline for the Rio de Flag Flood Control project. Additionally, residents will have the chance to ask questions about the project and provide input on the composite channel portion of the project design (see Figure 1). This meeting will be held on Tuesday, August 22nd from 4-7pm at City Hall in the Council Conference Room (211 W Aspen Ave.). Please come prepared with any questions you might have about this project or the project timeline.